The authorities in Ukraine have been sharply criticised for faking the murder of a Russian dissident journalist in Kiev. An official from the Organization for Security and Co-operation in Europe (OSCE) said Ukraine was spreading "false information". Reporters Without Borders said it was "part of an information war". Ukraine said it had acted to foil a Russian plot to kill Arkady Babchenko. Moscow said it was a provocation. 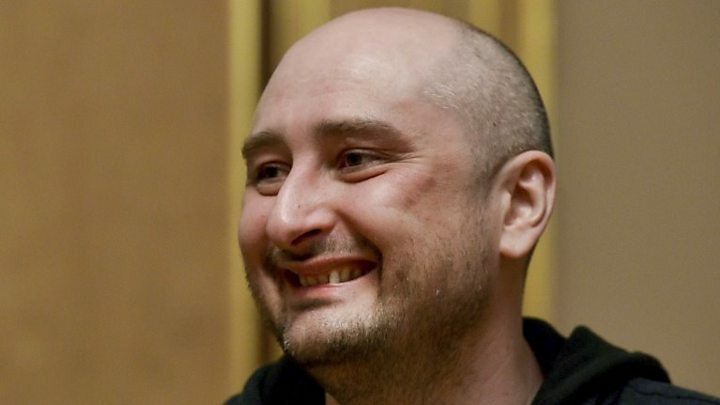 Babchenko, a 41-year-old critic of the Kremlin, sprang a major surprise when he arrived at a press conference in Kiev on Wednesday - the day after he was reported dead. The head of Ukraine's security service, Vasyl Hrytsak, said an elaborate sting operation had been set up to catch hitmen paid by Russian forces. Police reported making one arrest. Relations between Kiev and Moscow have been tense since Moscow annexed Crimea in 2014 and was accused of covertly backing rebels in the bloody conflict in eastern Ukraine. Why is Ukraine being criticised? Ukraine was accused of undermining the credibility of journalists. Harlem Desir, the OSCE's representative on the freedom of the media, said: "I deplore the decision to spread false information on the life of a journalist. It is the duty of the state to provide correct information to the public." "Reporters Without Borders expresses its sharp indignation on learning of the Ukrainian secret service's manipulation carried out as part of an information war," said Christophe Deloire, the group's head. "It is always very dangerous for states to play with facts and especially on the backs of journalists." Russia's foreign ministry spokeswoman Maria Zakharova described the Ukrainian operation as "a masquerade" done for "propagandistic effect". Babchenko's wife said on Tuesday she had found her husband at the entrance to their apartment block with bullet wounds in his back, and he was reported to have died in an ambulance later. But on Wednesday there were gasps at a Kiev press conference when Babchenko entered the room. Babchenko later tweeted to say he would "die at 96" after "dancing on Putin's grave", referring to Russian President Vladimir Putin. Ukrainian President Petro Poroshenko said Kiev would offer protection to Babchenko and his family. "It is unlikely that Moscow will calm down," he added. Was Babchenko a marked man? The journalist fled Russia in 2017 after writing about the crash of a Russian military passenger jet in which 92 people died. He said his Facebook post, in which he described Russia as an "aggressor", had led to death threats from the Russian state. Babchenko said he had been informed a month ago about an alleged Russian plot against him and had agreed to co-operate with Ukraine's counter-operation. Mr Hrytsak alleged that Russian security forces had recruited a Ukrainian citizen to find hitmen. He said the citizen had approached several acquaintances, offering $30,000 (£22,600) for the killing, one of whom revealed the plot to the security services.